Alastair Cook capped off a brilliant England career with a century in his final Test innings, in the process edging past Kumar Sangakkara to become the left-hander with the most runs ever in the longest format. 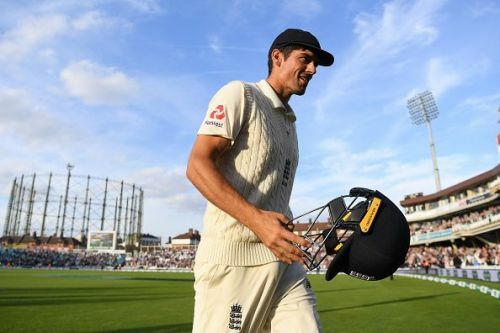 Speaking to Sky Sports after an eventful day's play at The Oval, Cook conceded that it was a dream come true, becoming just the fifth batsman to score a century in the first and last Test of his career. "Ever since (the retirement) was announced, I suppose you hope you have a good week. To top it off with a score here is just incredible. Sometimes dreams come true," Cook said. "On a purely selfish level, even at the end, fielding at short leg with the Barmy Army singing, it's why you play sport - occasionally those little selfish moments. It was very special. It's just been a great week. "It was a 'don't get out for nought' game for me. I didn't really think about the hundred until I got into the eighties and I felt I had a chance. Cook reached his 34th, and last, Test century via an overthrow, and went on to make 147 as England gave India a 464-run target to chase. "It was very emotional - there was definitely a lump in my throat with that ovation. I had about 30 friends here and family, so you couldn't have scripted it. It's one of those days where you will look back and forever go 'Wow'. "I remember seeing Nasser (Hussain) score a hundred in his final Test and I thought: 'What a great way to finish!' For me to say the last time I batted for England I got a hundred is special", he added. Cook had, after the fourth Test, declared that the fifth and final Test of the ongoing series will be his last international game, putting to end a 12-year-journey that started back in 2006. "It's hundreds, winning moments and spending time with and developing a team. It's been one hell of a journey."